Razer is aware of the recently discovered security issue affecting microprocessors used in laptops and desktop computers, including our own. To combat these vulnerabilities, updates are needed for the computer's operating system and the firmware of the microprocessors. Recent updates to the Windows OS were put in place and it is highly recommended users install all available Windows Updates to their desktop computers or laptops. Razer is currently developing updates for the microprocessors used in all Razer Blade laptops. How do I replace the battery in my Razer Blade Pro Laptop? Razer Blade Pro batteries should be replaced by an authorized Razer Repair Center. Should you feel your battery is defective and needs replacing, please contact the Razer Support team here and we will be happy to assist you. If you encounter this, please perform Synapse update through Settings >> Check for Updates. If the updates not able to run or Synapse not able to load, please uninstall Synapse and download the latest Synapse Framework from Razer support site. Since I started using Windows 10 my computer will not go into sleep mode and my screen saver mode will not come on. This happens due to a compatibility issues between Joystick devices and Windows 10. To avoid this please disable the game controller device under Device Manager >> Human Interface Device >> HID-compliant Game Controller. However, do note that when you disable the game controller, you might lose virtual joystick related features in Synapse. If you encounter this, please go to device manager and uninstall all devices under “Network adapters”, especially VPN adapters and Wi-Fi adapters. After these devices are uninstalled, click on “Action” along the top of the device manager window and then select “Scan for hardware changes”. Then install the latest Wi-Fi drivers posted on the Razer Support website. If you encounter this, please close the installer wizard and complete your OS upgrade first. You will be able to perform driver and applications update after Windows 10 upgrade completed without problem. How do I update my Razer Blade to Windows 10? There are certain updated drivers you will have to install and we have created a guide to help you with the update process. Please visit www.razersupport.com/downloads and select “Razer Systems” and then the model Blade you are attempting to update. Please view the “Windows 10 Upgrade Guide” for complete details regarding the update process. Don’t panic when you see this message, windows is trying to perform automatic uninstallation of unused language packs to free up more space on your system. The duration depends on how many languages are being removed as it will accumulate if the system is never shutdown/reboot for a period of time. Razer has authorized repair centers in every region where the Blade is currently sold. To set up a repair at one of our repair centers please contact our support team at www.razersupport.com/email . Our support team will be happy to give you a rough estimate of the repair costs, but final costs cannot be determined until the unit is physically inspected at the repair center. Only authorized Razer Repair Centers will have the parts and specialized training required to repair your Razer Blade. All Systems must be repaired at a Razer Service Center, Internal components are not available for purchase at this time. Can the Razer Blade Pro be used as a second display to my PC/XBOX/PS3, Etc.? No, the HDMI port is ONLY intended for "Video Out." Can I use two displays on the HDMI port for a total of three? No, dual external displays are not possible. Does the Razer Blade Pro Support 3D? No, at this time, the Razer Blade does not support 3D display modes. Does the Razer Blade Pro Support Miracast? Does Razer offer a guide on how to use the Switchblade User Interface? Razer has developed intuitive guides and will continue to develop these guides as more applications are released for the Switchblade User Interface. For more information on the Switchblade User Interface, please visit www.razerzone.com/switchblade-ui. Can I upgrade my NVIDIA GeForce GTX960M with a later NVIDIA or AMD graphics module? The Razer Blade features a custom GTX960M design that is integrated into the motherboard and does not utilize a removable MXM module. Because of this unique design, upgrades are not available. Does the Razer Blade Pro Support Intel WiDi? WiDi is not supported, as it requires an Intel wireless adapter while the Blade/Blade pro feature a Intel Wireless-AC 7260HMW card. How can I contact Razer Support if I'm having problems with my Razer Blade Pro? Please visit www.razersupport.com, email systems@razersupport.com or call 1-855-87-BLADE (1-855-872-5233). How do I run my games or applications at optimal performance? 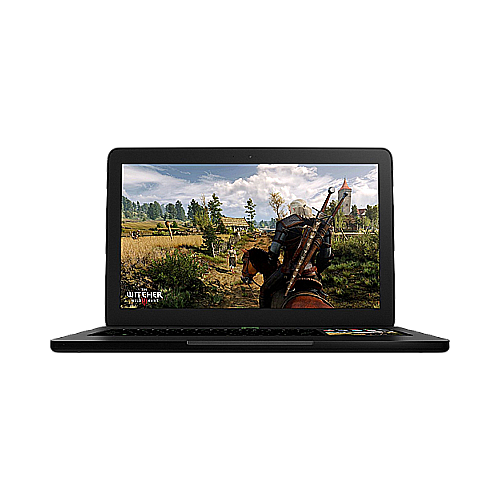 The Razer Blade features two graphics processors (Intel HD and NVIDIA GTX 960M). If you would like optimal performance be sure to set your program to utilize the NVIDIA GTX960M graphics processor. 1. Right click on your desktop and click "NVIDIA Control Panel." 2. Under "Manage 3D settings", click on the "Program Settings" tab. 3. Select or Add the program you wish to run and select the preferred graphics processor as the High performance NVIDIA processor. I am not able to back-page to the Twitter site after loading an external link. Why? If you experience this problem press the "back-page" key 2 to 5 times. An alternate solution will be to press the "Razer Home" key and relaunch Twitter. I am not able to open the link in the Twitter home page. Why? If you experience this problem, proceed to the page of the person who posted the tweet with a link. You should be able to open the link from there. I put my Blade to sleep by closing the cover when the O/S is still launching. When I open up the unit the screen is blank. How can I solve this? If you experience this problem, please wait a moment for the light on the keyboard to go off. Then, press the power switch to wake up the unit. Is there an SDK available for the Blade and the SwitchBlade UI? Yes, please visit this site for details and availability of the SDK kit for the SwitchBlade UI. Most modems have an indicator that shows if it is connected to the Internet. Check your modem for that indicator. If your modem does indicate that you are connected to the Internet, try restarting your modem. If you're still have issues, please contact your local Internet provider to ensure that the connection is stable. If you still have problems connecting, please contact Razer Blade Technical Support. What do the different colors on my status indicator mean? The front Led indicator turns on only when the lid is closed. The power button indicator turns on when the lid is open. Note* The status indicator is not a HDD indicator. What happens if my Internet disconnects? Razer Synapse 2.0 will continue to function even if your Internet disconnects as long as you check the "Stay Logged In" box on the login screen. Razer strongly advises all users to stay logged in. When my Razer Blade Pro comes out of the sleep or standby mode, the track pad does not work. How can I fix this? If you experience this problem, wait for the dialog box titled "Synaptics Touchpad Enhancements" to appear. Then, press and hold the "alt" key and then press the "tab" key to activate the dialog box. Why doesn't my Razer Blade Pro have an optical drive? How can I install applications without an optical drive? As digital downloads have become the standard, Razer eliminated the optical drive to make the Razer Blade Pro even thinner. You can purchase an external, USB-based optical drive to pair with the Razer Blade. Any damage or issues caused during installation or as a result of incompatible parts being used is NOT covered under the warranty, and may void the warranty coverage. Will Razer continue to deliver Switchblade support with new applications and features? Razer will continue to work with industry partners to develop and release more functionality for use with the Switchblade UI. Will the Razer Blade Pro be compatible with other Razer Synapse 2.0 devices? Yes, any device that is Razer Synapse 2.0 ready will automatically sync your custom settings with the cloud server. If you were unable to find the answer to your question(s) in our FAQ, please don’t hesitate to contact us here or call 1-855-872-5233. If you were unable to troubleshoot and resolve any issues you are having with the knowledgebase (FAQ) and you feel your product is still defective, please don’t hesitate to contact us here or call 1-855-872-5233. If you are experiencing issues with the Razer device in a particular application, test the device in another application to confirm if the issue is specific to that application. If the Razer device functions properly in another application then the program is likely the cause of the issue. Please feel free to contact customer support to report the issue and see if there are any fixes or workarounds for the issue. What is the difference between "driver" and "firmware" updates the Razer Support Site? Where can I find drivers for my Razer product? Please visit this website to find all the latest drivers.